"Violet coprinus is a tall, slender-stemmed, light-green-capped mushroom of the Bitter Coast region with modest magical properties." Violet coprinus is a common mushroom found in abundance in the Bitter Coast region, as well as growing in caves. It is useful as a means of emergency escape when you are in deep water. Simply eating one raw should cause you to surface almost immediately, provided there is nothing solid between you and the surface. Having a couple on-hand for long dives can be a life-saver. 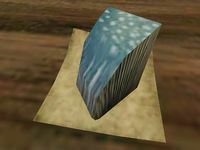 You will also need to bring a sample to Ajira at the Balmora Mages Guild during the Four Types of Mushrooms quest. 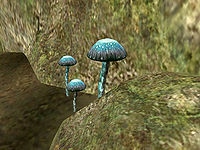 Violet coprinus is one of only two ingredients in vanilla Morrowind which can be used to create poison potions (not counting the rare poison), the other ingredient being luminous russula. The Tribunal expansion adds three other ingredients with a poison effect. * Cienne keeps her ingredients in a chest in her shop, rather than on her person. If you can gain access to this chest without being caught, you can have an unlimited supply for free. In some of Ajira's dialogue, she states that "coprinus comes from long-stemmed toadstools which glow blue at night", however, the plant does not glow blue. This page was last modified on 6 July 2016, at 09:13.